Well, the longest night of the year, the winter solstice, is behind us, but the nights are still long, aren’t they? We pull the curtains against the blank, black windows as the sun sets, click on a lamp and if we’re lucky, light a fire. Porch lights suddenly glow along our streets. We escape from the dark, fending it off with relief, as if we are warding off danger. But what if we welcomed the darkness? What if we paused before pulling the curtains and just looked at night coming on? Sunsets around here can be quite dramatic this time of year. 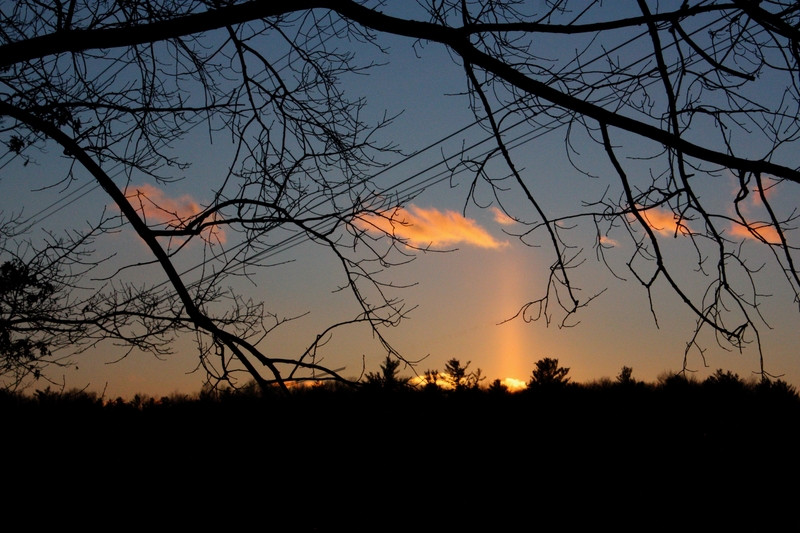 Winter is a time to look for “sun pillars,” when vertical beams of light occasionally appear near the sunset, caused by light reflecting on tiny ice crystals suspended in the atmosphere – like this one at our home one winter evening. And although I’ve never caught “wild geese that fly with the moon on their wings,” I have caught geese flying splashed with the pink of a sunset. Geese with sunset reflecting on their wings and breasts. 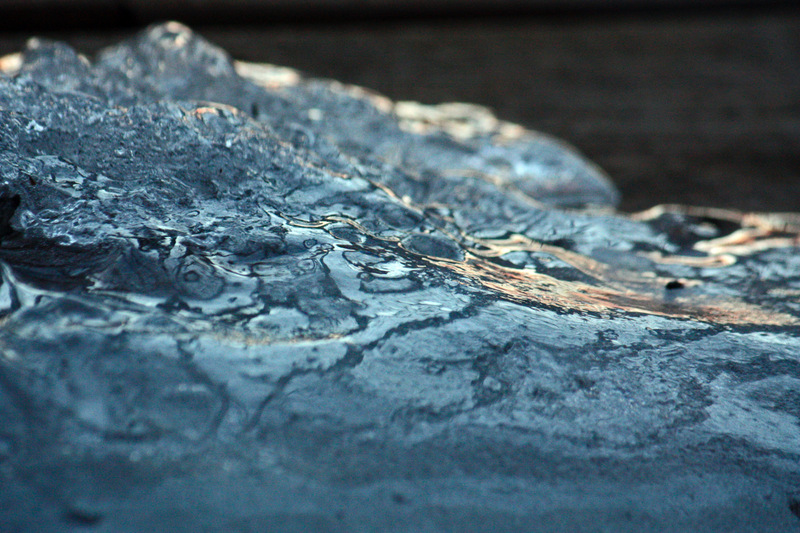 Even a stray chunk of ice can look quite magical when it catches a ray of orange light as dusk settles. Perhaps we could learn to stand in the dark on a snowy night and listen for the low hooting of the Great Horned Owl (Bubo virginianus). According to the Stokes Guide to Bird Behavior Vol. 3, they mate during the winter. But it’s difficult to hear their plaintive, long distance courting through tightly closed windows and doors. Maybe open the door a crack now and then, set your ear to it and listen. 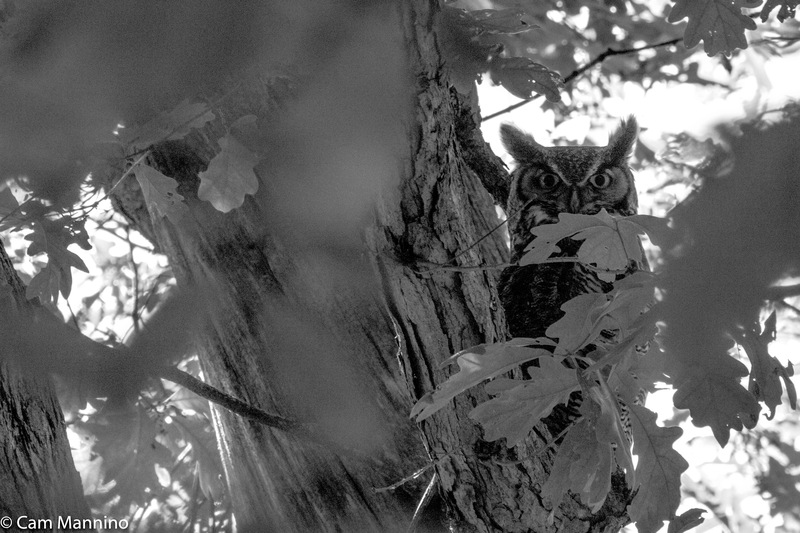 Seen at Bear Creek in the summer – here in black and white. 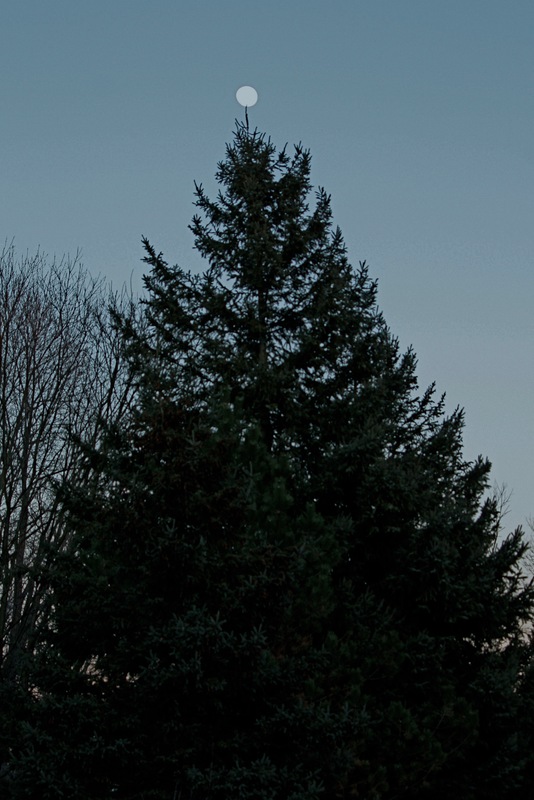 or smile at a pine tree topped by the full moon like the star on a Christmas tree! The intriguing thing about being out in the darkness is that it’s often not as dark as it seems from inside those black windows. The moon and the stars do shine, after all, and anything white – flowers in summer, snow in winter – catches that silver light and reflects it, creating patterns we miss if we aren’t looking. So this winter, perhaps we should consider venturing out into the dark – maybe with a friend to feel more comfortable at first. Or perhaps parents can take children out “owling” on a snowy night – and if you’re considering it, have a look at the gorgeous picture book Owl Moon by Jane Yolen for inspiration. Or just take them on a stroll around the lawn while scouting out Orion overhead or other constellations. 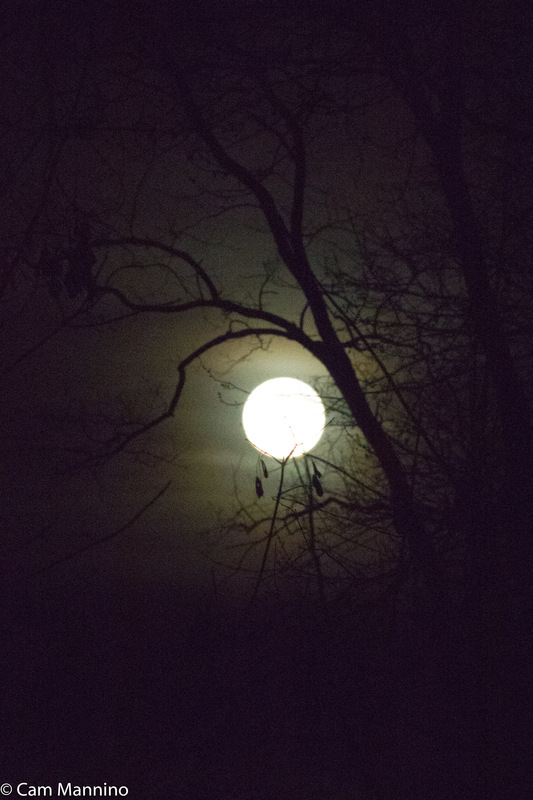 Even a walk down a long driveway can be exciting on a moonlit night. You can sing to yourself for courage if the possible presence of nocturnal animals makes you nervous; they most often run away at the sound of a human voice. 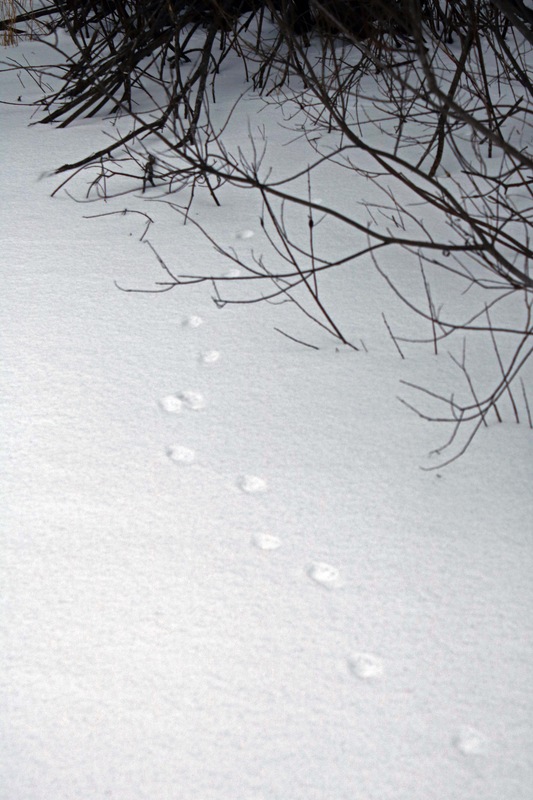 Or if you are intrigued by them, follow fox tracks in the moonlight. Maybe you could make it a personal or family ritual to just take a few minutes once a week to sit with a cup of cocoa, turn off the lights and stare through a darkened window. 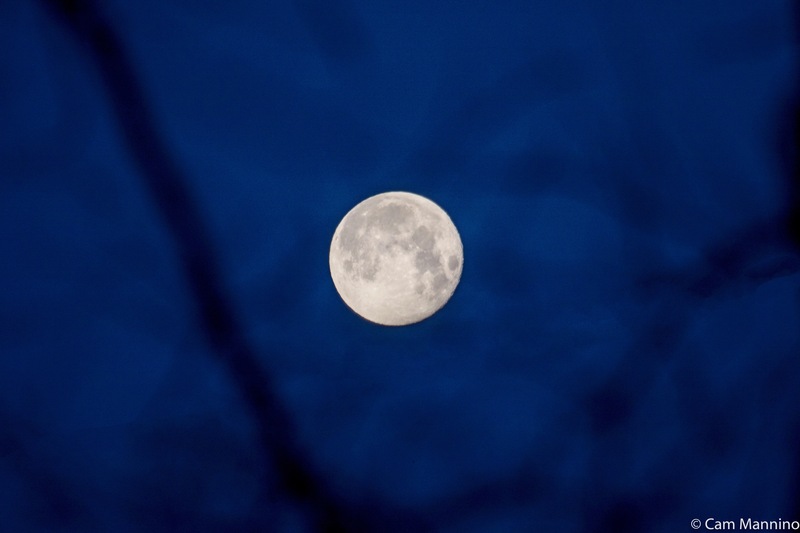 Watch the moon as it changes; perhaps record its phases on a calendar with your children or grandchildren. Open your door and listen to the song of wind in the pines and how it differs from songs “sung” through bare limbs. If you hear a coyote outside, consider calling your children to the door to listen to their song – and then howl along! Perhaps if we can become familiar with the velvet black of a winter night, its sounds and sights, we’ll be more comfortable with it. Let’s befriend the night and see the beauty that lies out there in the winter darkness. Charles Ilsley Park: Ah, It’s Spring! Oops…No, It’s Not. March in Michigan is such a tease! We had a glimpse of spring-like weather, but we knew it was too good to last, didn’t we? Winter came roaring back. I’ve been braving the corrugated potholes of Predmore Road to visit Charles Ilsley Park to see what these back-and-forth changes have wrought – and also to check out some great new nest boxes going up there. As usual, the spring-like weather provided lots of things to see. Winter’s return meant exploring tracks crisscrossing the snow, leaving clues of who’s been out and about when I’m not there. Presence and absence – sometimes both are interesting! On the way into the park, we spotted a creature who, like us, had been fooled by the warmer weather. A Woolly Bear Caterpillar wended its way across the path, hoping to find some sustenance before spinning its cocoon to emerge as an Isabella Tiger Moth (Pyrrharctia isabella). The moth photo below is by Steve Jurvetson (CC BY) at inaturalist.org. (Click on the photos to enlarge them; hover your cursor for captions). A Woolly Bear Caterpillar may have hatched a bit prematurely. 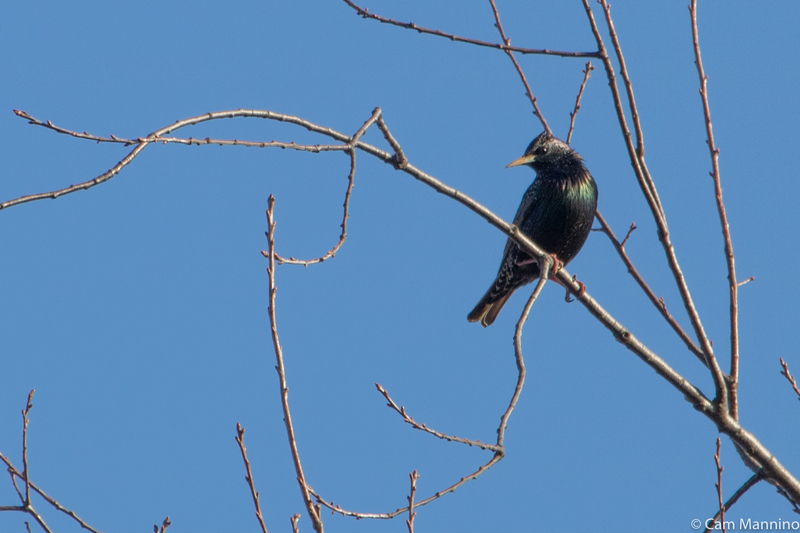 A European Starling (Sturnus vulgaris) glistened in the morning sunlight in a tree at the top of the central meadow. In the autumn, starlings molt into feathers with bright white tips, which makes them look spotted all over. During the winter, the white tips wear off (called “wear molt”), leaving their feathers a glossy, iridescent bronze for the breeding season. Odd to see one all by itself when we so often see them in large flocks. A European Starling who has lost its winter spots through “wear molt” and is ready for the breeding season. Tiny yellow-gilled mushrooms covered the slope as we entered the central meadow. Most mushrooms defy identification for me, so if anyone can ID this one, please leave a comment! Later Reg found an extremely light, two inch ball in the grass – an Oak Gall. A Gall Wasp (family Cynipidae) laid an egg on an oak last year, and when the larva hatched inside, it injected a chemical into the plant creating a tissue-like secretion that it can feed on until it emerges as an adult wasp. Perhaps, like the Woolly Bear, it may have misjudged its moment! Or the larva may have provided some wintertime sustenance for a bird. Gilled yellow mushrooms like this covered a hillside in the central meadow. ID anyone? 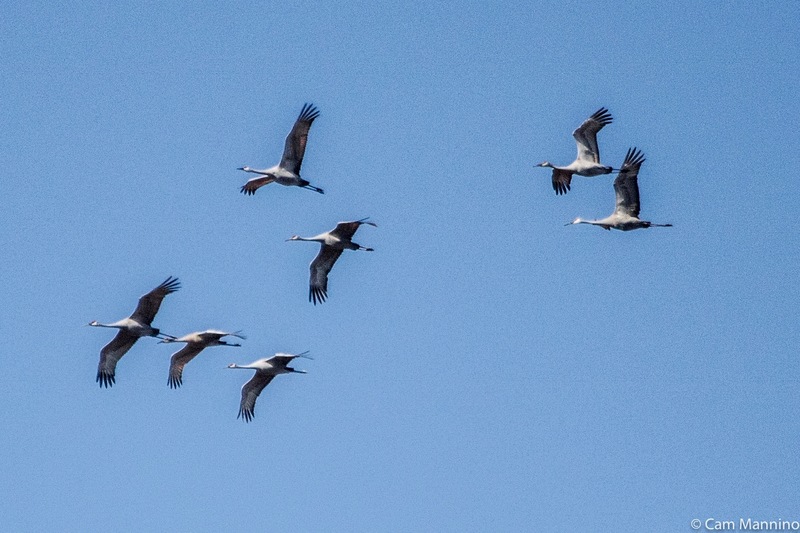 High above, a flock of Sandhill Cranes (Antigone canadensis) called from the chilly, blue sky. 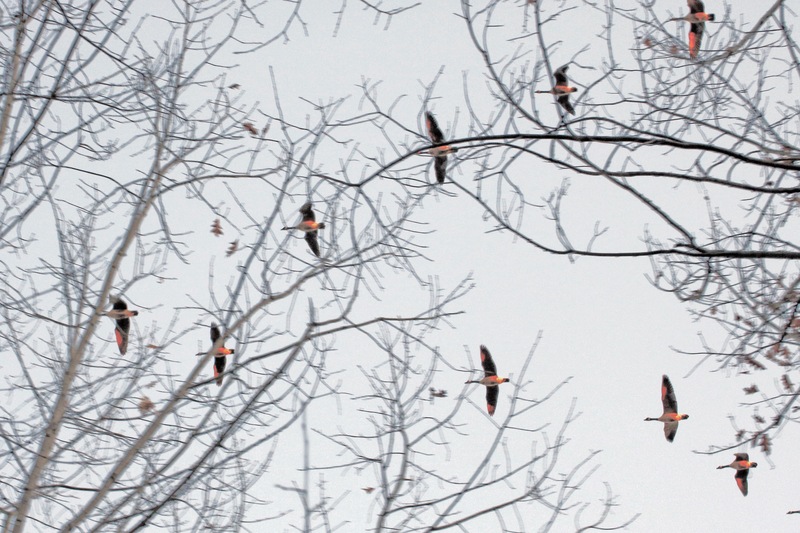 Theses ancient birds must have felt the pull of the warming days and ventured north from their winter feeding grounds in Ohio and further south. I love their hoarse, wild calls (click on “Listen” at the link) that sound almost prehistoric. According to Cornell Lab of Ornithology, these cranes use their extra long windpipes, which extend to their sternum, in order to make that sound. Soon they’ll be performing their graceful mating dances – leaping whimsically into the air and floating back down with the partners that they choose for life. 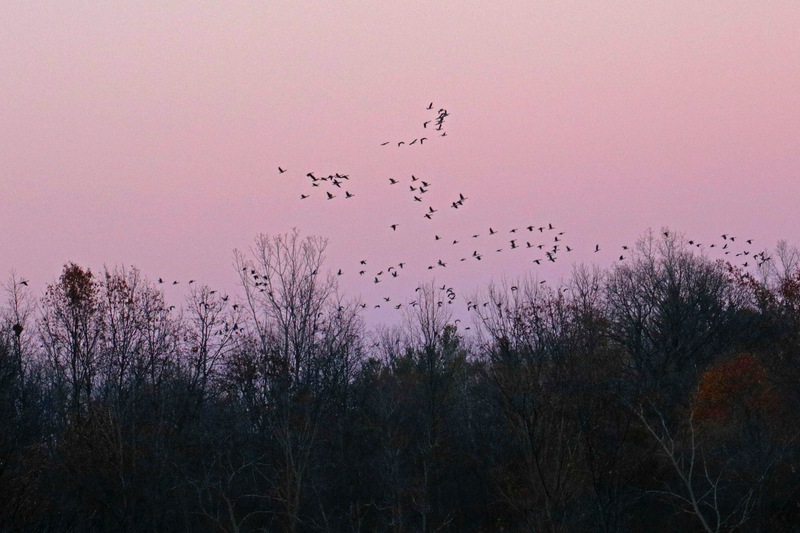 A flock of Sandhill Cranes returning from Ohio or further south. Newly-returned Red-winged Blackbirds (Agelaius phoeniceus) flashed their bright red epaulets by hunching their wings, accompanied by a buzzing call to establish their territories. Some stayed during the winter, but most moved south last fall as the weather got colder. The kwirr call of the Red-bellied Woodpeckers (Melanerpes carolinus) could also be heard in the treetops, as well as its drumming (click on “drum” at this link), another way of establishing its territory and attracting a mate.. And Red-tailed Hawks (Buteo jamaicensis) pair up this time of year, soaring and circling lazily in the rising thermals of warmer air. I’ve read that if you’re lucky, you’ll see them drop their talons in flight, apparently an important indicator that two hawks are interested in each other. Sometimes they even lock talons and tumble together in flight! The hawks I saw were circling high in the sky – out of the reach, I’m afraid, of my longest lens, so please pardon the blur. A Red-winged Blackbird cranked out his spring buzz call. Last spring, the birding group saw a female Baltimore Oriole (Icterus galbula) approaching her nest in a tree along the entrance trail. The actual basket-like nest was tough to see among the leaves. But as Reg and I left the park on that cold spring-like day, the nest was visible, sturdily attached to the tip of a branch, having braved the winter winds. She’ll weave a new one this spring from grass, grapevine bark, horsehair, wool, occasionally even recycling materials from a previous nest, according to Cornell’s allaboutbirds.org. The Oriole’s beautifully woven nest which has survived the winter winds. 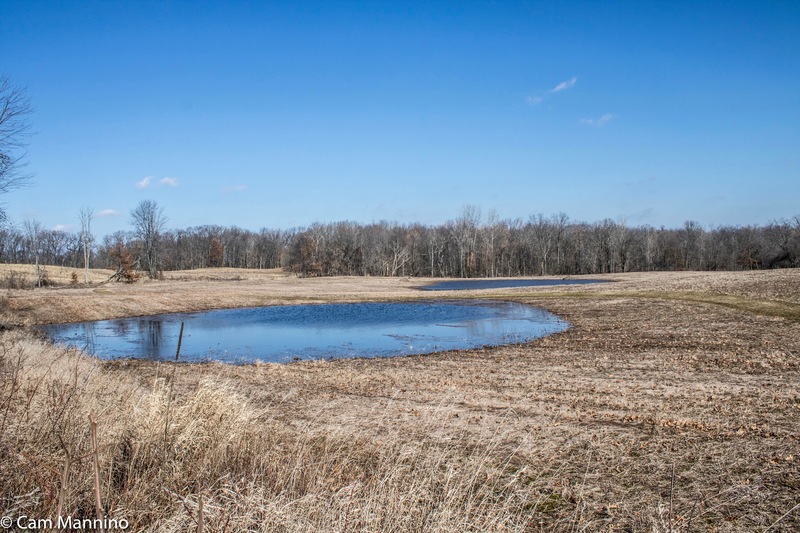 Out in the eastern meadow, we came across two other volunteers, Tom Korb and his nephew Alex Korb, both valued members of the Wednesday birding group. They were making last minute changes to some bluebird nest boxes that Tom’s created for the Oakland Township. Tom built several nest boxes for Charles Ilsley Park and Draper Twin Lake Park with the talented assistance of Sue Ferko. The picture on the right below shows Tom and Sue installing a nest box at Draper Twin Lake Park last week. Left to right: The new bluebird house, volunteer Tom Korb, my husband Reg and Tom’s nephew, Alex Korb. On the advice of birder extraordinaire, Ruth Glass, Tom and Sue also built some Peterson-style bluebird nest boxes that are triangular in shape. Ruth has found that bluebirds seem to prefer the Peterson houses at Stony Creek Metropark. So Ben and Tom decided to experiment by putting up both types to see which ones the bluebirds at our parks preferred. Tom also constructed two nest boxes for for American Kestrels (Falco sparverius), North America’s smallest falcons. Kestrels nest in cavities along wooded edges, so that’s where the new box in Ilsley Park was placed, in the tree line between the central and western meadows. Chickadee houses will soon be installed as well. We’ll see if our bluebirds prefer one kind of nest box over another. Birding group paired bluebird boxes to see if bluebirds and tree swallows will share rather than compete. You’ll also note that the bluebird houses are installed in pairs. The theory is that Eastern Bluebirds (Sialia sialis) and Tree Swallows (Tachycineta bicolor), who often compete for housing, will share space if there are two houses together. So we shall see! Bluebirds began to investigate Tom’s houses as soon as they were up, and I saw a pair every time I hiked there since. I’ve only seen an American Kestrel once from a distance after a prescribed burn at Bear Creek – so I’m hoping to see a pair at their new nest box sometime soon. (Kestrel photo by Steven Mlodinow from inaturalist.org). Snow and shadows surrounded the melt ponds about a week after the photo posted above at the top of the blog. On my last trip to the park, everything was silent except for the occasional trill or cluck of the indomitable Red-winged Blackbird and the distant kwirr of the Red-bellied Woodpecker. When I arrived in the late afternoon, no other human had explored the park that day – probably due to that corrugated road! – so the trails were pure white, not a footprint in sight! 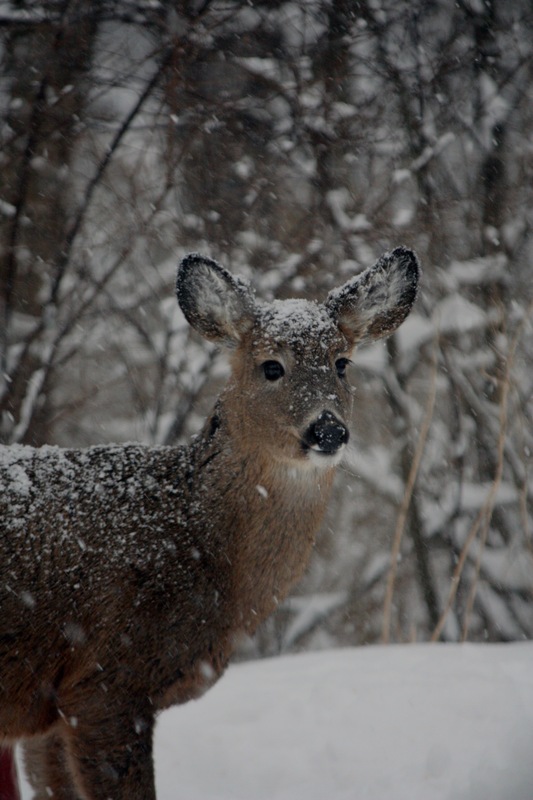 But clearly, the wildlife enjoyed having the park to themselves after the snow fell. I quickly spotted the first track of a Coyote (Canis latrans). Canines can’t retract their claws, so in the photo below, you’ll see the two nail marks at the top of the print. The larger pads are located outside, rather than directly below, the smaller pads, which is typical of coyotes. As usual, the prints were neatly placed in a straight line. Our well-fed dogs can afford to wander as they walk, but wild coyotes on the hunt can’t afford to waste energy, especially on cold days. When I reached the central meadow, I spotted two separate coyote tracks heading east over the hill. One went almost straight up and over the highest park of the hill. The other took an easier route around the lower end. The first coyote headed straight up the highest part of the hill, heading east. The second coyote found a slightly easier route along the lower end of the hill. As I followed the tracks, I imagined what might have occurred. When the snow storm came out of the northeast, a pair of coyotes probably trotted off to the west where perhaps the hill would break some of the wind. And then I came across a sight I’d never seen before. The tracks led to a flat area on the far western meadow beyond the tree line. 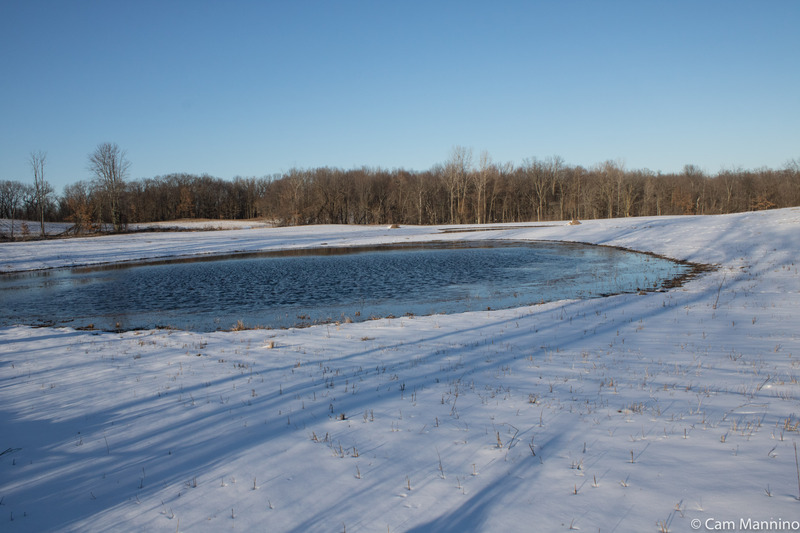 There the snow had been stirred up near several medium-sized patches of bare earth where the snow had melted off the grass. 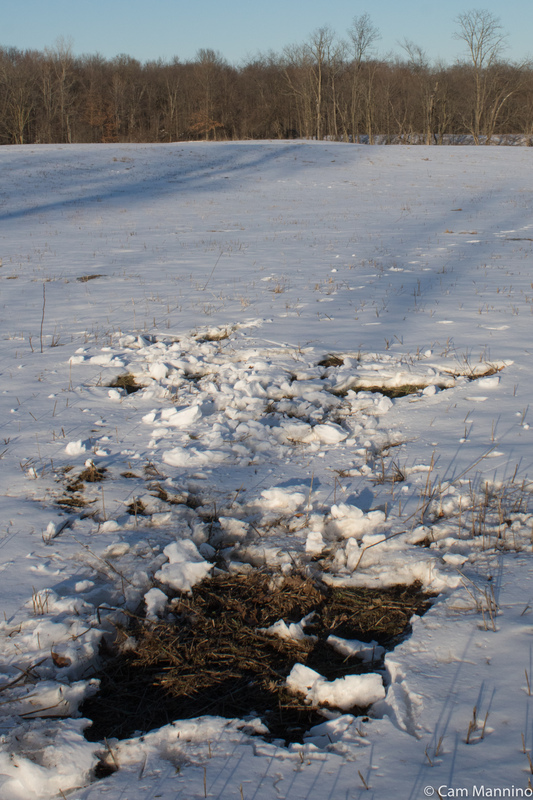 The bare spots were too small for deer beds and several had clear coyote tracks that appeared to be leading to them. Could this be a group of coyote beds, I wondered? Coyote tracks led to this area where the snow was stirred up and bare patches showed where the snow had melted. A coyote bed? That night I researched where coyotes sleep and found that they are known to just lay down in the open as long as there are no humans or other predators to disturb them. And I found Google images of them laying in open snowy fields. 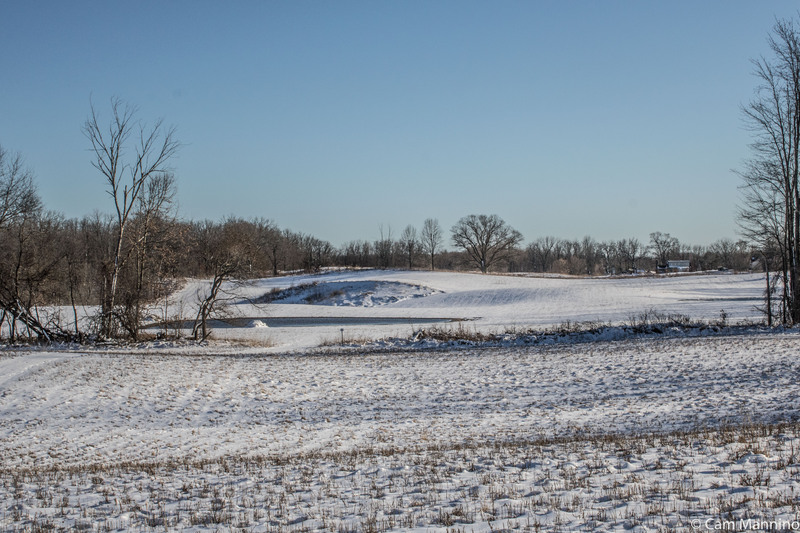 Since coyotes are the top predators in Charles Ilsley Park, and humans live a fair distance from this field, I’m guessing that the coyotes crossed the tree line, found a low spot in the field, turned around a few times in the snow the way canines often do, and settled down for the night. But who knows? If anyone has a more accurate interpretation, I’m open to it. Anyway, following the tracks and finding this curious area offered me a fun expedition late on a snowy afternoon. Another nocturnal traveler left its tracks as well. 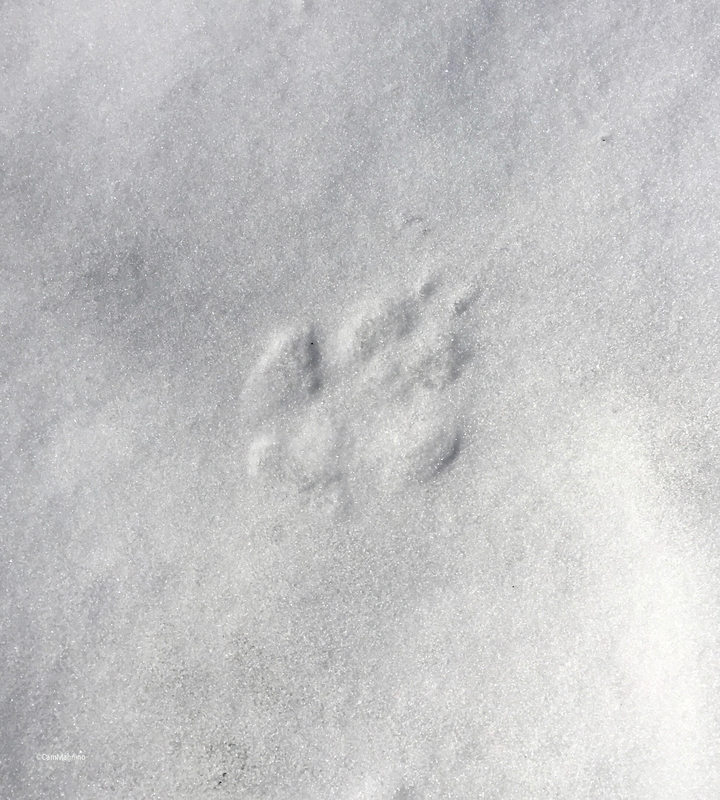 These small, roundish canine tracks are most likely to have come from a Red Fox (Vulpes vulpes) trotting along a trail on the eastern prairie on the previous night. Its tracks were quite near those of a coyote, and I saw no signs of conflict, so I doubt they ever encountered each other that night. Recently though, Tom Korb did spot the clean skull of what he believed was a Red Fox at Charles Ilsley Park, so perhaps another fox met a coyote at some point! The photo below of a running Red Fox was taken at my home several years ago, so I’m just guessing about this midnight scenario. 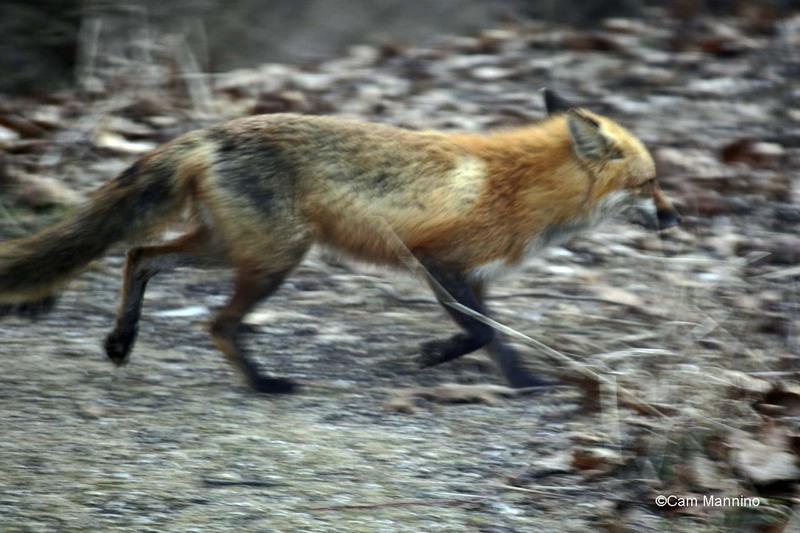 Red fox (Vulpes vulpes) on the run near my home several years ago. Daytime park residents left their marks as well. I heard but never saw the little creature who I’m thinking left these four tiny tracks – the American Red Squirrel (Tamiasciurus hudsonicus). It saw me before I reached its hideout log, so I’ve added a photo of one who popped up out of snow near my back door a few winters ago. It was looking for birdseed under the snow cover. A Red Squirrel that popped out of the snow near my home. And American Crows (Corvus brachyrhynchos) were strutting about in the snow as well. I saw one dive bombing a Red-tailed Hawk one morning, but it was too far off for a photo. 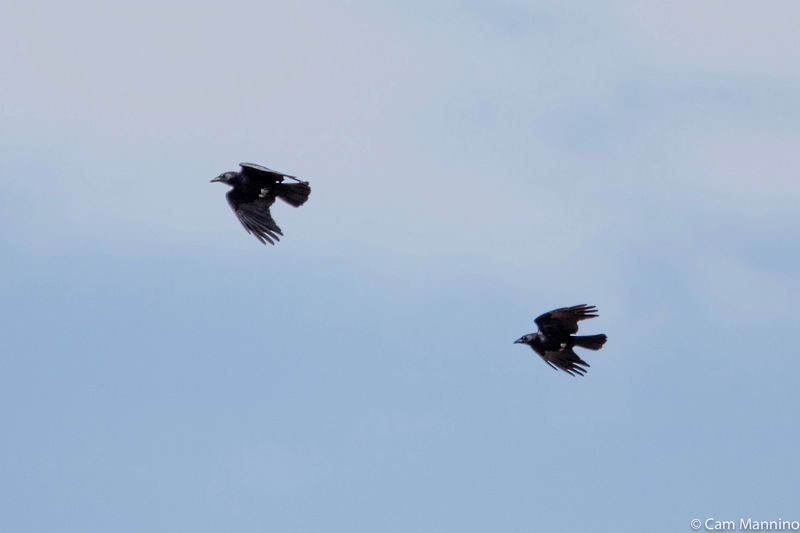 So here’s a shot of two in flight last March and what I believe are the tracks of a crow who left prints of its feet and dragging tail feathers in the snow last week near a tree line at Charles Ilsley Park. Like wolves, crows cleverly walk in a straight line to save energy. Note the big, hooked claw on the back of the foot which indicates that its probably not a turkey track. 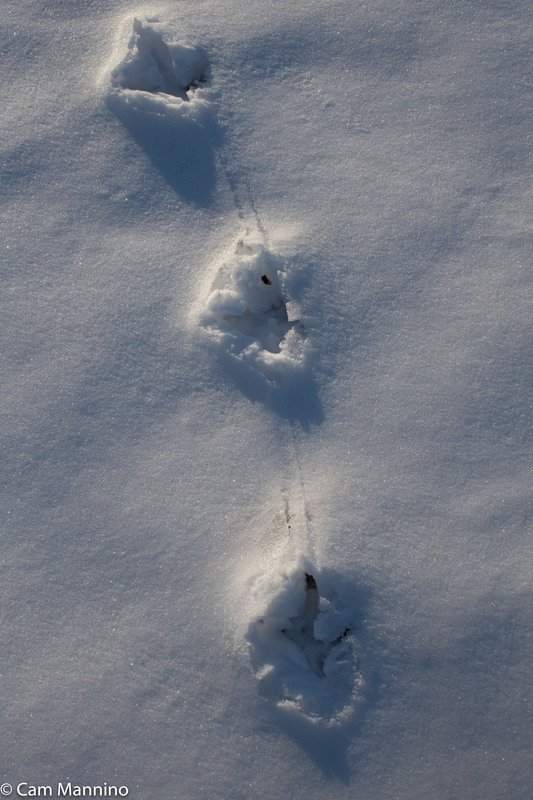 Crow feet and tail prints making a straight line in the snow. Such fun to think of being the only human in the park that snowy afternoon, leaving my big sloppy footprints among the precise and delicate ones of so many wild neighbors! If you’re a more experienced tracker than I am (I’m a novice! ), feel free to comment and set me straight! March can be a frustrating month. One day I get to see the Sandhill Cranes bugling overhead. I kneel to watch an unlucky Woolly Bear Caterpillar wend its through wet grass. 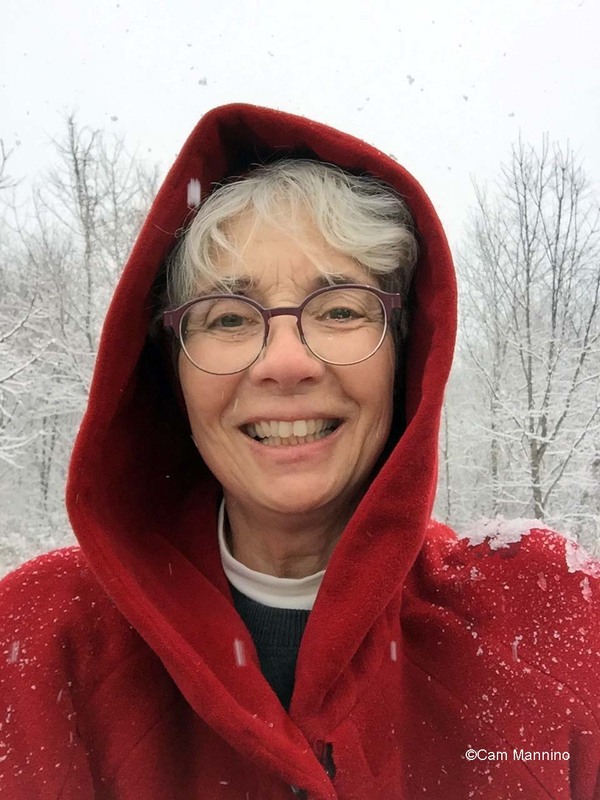 And a week later, the snow descends again, making life more difficult for the cranes, perhaps deadly for the caterpillar and sometimes less visually interesting for a park visitor with a camera around her neck and three solid months of winter under her belt. But then I notice the coyote prints trailing up a small hill and follow them to a disturbed patch of ground. Normally, when I hear coyotes howling and yipping near my house in the middle of the night, I picture a small group sitting on its haunches in the moonlight before retiring to a snug den. 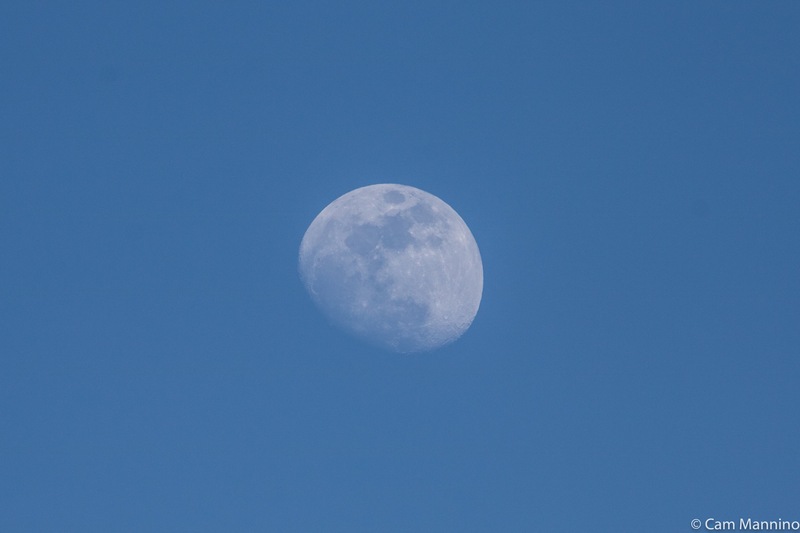 Moon rise near sunset at Charles Ilsley Park last week. But nature has handed me a possible new image of this clever, well-adapted animal that’s moved into my territory the last few years. Now I can envision my coyote neighbors as wild creatures so sure of themselves, of their ability to handle their world, that they can just lay down with their traveling companions, sing together under the moon for a few minutes, then curl up in the snow and drift off to sleep. That’s probably one of the reasons I spend time in nature as often as I do. It never stops teaching me to pay attention. And it never stops reminding me that human lives are embedded within the lives of a whole panoply of living beings – plants and animals that have adapted to change, survived and even thrived. Maybe we humans, so often resistant to change, can learn do do the same. And that helps me drift off to sleep. My sources for information, besides Oakland Township's Stewardship Manager Ben VanderWeide, are as follows: Caterpillars of Eastern North America by David L. Wagner;inaturalist.org;Allaboutbirds.org, the website of the Cornell Ornithology Lab at Cornell University; Wikipedia; Herbarium of the University of Michigan at michiganflora.net.